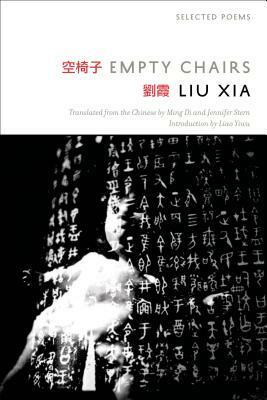 —from "June 2nd, 1989 (for Xiaobo)"
Empty Chairs presents the poetry of Liu Xia for the first time freely in both English translation and in the Chinese original. Selected from thirty years of her work, and including some of her haunting photography, this book creates a portrait of a life lived under duress, a voice in danger of being silenced, and a spirit that is shaken but so far indomitable. Liu Xia's poems are potent, acute moments of inquiry that peel back to expose the fraught complexity of an interior world. They are felt and insightful, colored through with political constraints even as they seep beyond those constraints and toward love. Liu Xia is a Chinese poet and artist. English translations of her poetry by Ming Di and Jennifer Stern have been published by PEN America, Chinese PEN, the BBC, The Guardian, the Margins for the Asian American Writers' Workshop, Poetry, the Poetry Society of America, and Words Without Borders. Liu Xia's photographs have appeared in galleries throughout the world. She has been living under strict house arrest since her husband, the poet and activist Liu Xiaobo, was imprisoned in 2009 for "inciting subversion of state power" and then received the Nobel Peace Prize in 2010.